Thirty years after her death, Marilyn Monroe still lives in the hearts of many. She also lives in a 9" x12" simulated gold frame on the wall of my bedroom/office/art studio. An old friend of mine and fellow Background Actor dropped buy to see some paintings I was interested in selling. He saw the autographed picture of Marilyn Monroe I have hanging on my wall, which was a gift to me from a friend 20 years ago. I did not think much of it until he mentioned that if could be worth money. What starving artist does not need money? I had him call a friend of his who was a Marilyn memorabilia aficionado, in hopes he could tell me what it might be worth. His friend told me that if the signature was real it could be worth $6000.00. Thinking that $6000.00 would make a nice dent in my credit card bill, I decided to call my friend again to ask him he could put me in contact with a person that could tell me about the authenticity of the signature. He gave me the name of a man named Greg who was the president of an organization known as "Marilyn Remembered" here in Hollywood. I was amazed to find out that there was still an organization that honored Marilyn Monroe. 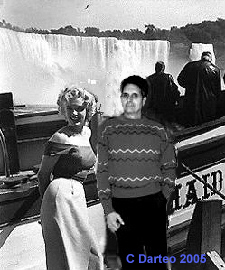 It just so happened that they were having a meeting the evening of the day I called and he invited me to come, offering that there would be some Marilyn experts there that might be able to help me. The meeting was in Greg's stucco house on one of the many residential streets here in Hollywood. People in Tinsel Town are never run of the mill, and I was not disappointed at the collection of men and women I found at this meeting. There as a guest, was a man who had produced a half hour documentary on the mystery of her death with a new twist. Instead of the CIA or Robert Kennedy, he points to the maid Marilyn's psychiatrist hired to take care of Marilyn. It seems this woman was a registered psychotic and was committed to an institution some time after Marilyn's death. Everyone at the meeting who had been living and breathing Marilyn for years had their own theory on how and what killed her. The subject had been address so often in their small circle, they all declined to get into that sort of discussion once again. We were to be the first people to view the documentary before it aired on the Entertainment Network. It was not due to go on TV until later that year. The guest speaker was a former child star named George Winslow who appeared with Marilyn in two films, "Gentlemen Prefer Blondes" and "Monkey Business". He was now a grown man of some 50 odd years old. He became emotional when he spoke of his dear friend who he had known as a child. If you know the film "Gentleman Prefer Blondes", George Winslow was the little boy that helps Marilyn, when she gets stuck in the porthole of the ocean liner they are traveling on. He was the kid with the fog horn voice, but not the one from the Little Rascals, that was in the 1930's. George Winslow worked as a child actor in the 1950's. To my surprise, I was also asked to stand up and speak about the photo I had. I was also able to mention that the memory Marilyn was very alive in Italy and that my friend Prudencia, an actress in Rome, took me to the theater to see a performance about Marilyn, written and performed in the Italian language by an Italian woman who looked just like her. One room of Greg's small house was dedicated Marilyn memorabilia. I was able to compare the signature on the photo I had of her, with the signature on the bank note she wrote to her maid two weeks before she died. The signature on the check was real and verified. To my disappointment it did not match the signature on the photo I had. Greg said that very often her secretary would sign those photo's, and he had a gut feeling that this was the case with the picture I had. So another dream was dashed on the rocks, but I have become used to broken dreams living here in Hollywood. One of the oddest things for me at this gathering was that fact that I had always wondered about this kid, George Winslow, who got to act in movies with Marilyn Monroe. I always wondered what happened to him and it tickled me to death to be in the same small living room listening to his remembrance of Marilyn, which became rather weepy at times. He seemed to be an emotional wreck, which may be the all too typical condition of former child actors who are fawned over as children, and then dumped when they were are no longer the cute little thing everybody loved so much. For George, his signature fog horn voice gave up on him as well, when he reached puberty. Instead of getting lower, it got higher and he lost the sotto voice. He does small parts now, but you would never recognize him as the child actor he once was. Even after knowing he was going to be there, I could not find him. I was really surprised to see the guy who stood up when he was introduced. He was dressed in a beat up 50's raincoat and neckerchief that barely tied around his thick neck. You don't see men wearing neckerchiefs much anymore. I suppose any one growing up bouncing on the knees of the likes of people like Marilyn Monroe, Gary Grant, and Ginger Rogers, was bound to be a non-conformist. I would think after that, all people would be totally boring. I couldn't help thinking he had the tortured look of a person that thought he had fallen from grace, when all he did was to simply grow up. Mr. Winslow mentioned that he could still remember where he was when he heard the news that Marilyn had died. At that moment I got such a clear picture of the day in my parents home when I heard the news. I was in my teens and I remember breaking down and crying like a baby when I heard the reporter say that Marilyn had been found dead. My tears weren't only for Marilyn. My mother, herself a Marilyn Monroe type, with her platinum hair and the way she liked to dress, reminded me of Marilyn when I was a child. My mother also had severe emotional problems. The parallel was always there for me. My mother's mental illness was just beginning to bloom then and I was just beginning to realize the extent of the problem. I think I may have been the first in the family to really understand it. I could see that my mom and Marilyn were both so beautiful, but that demon inside them would never let them enjoy it. It was minutes before I heard the news that Marilyn had died, that I realized that my mother would never really ever get over this illness. The tragic proportions of the life I saw my mother and father engaged in became all too clear. The radio was playing and I think it was raining outside. It was hot and humid, the air so thick, you could cut it with a knife. It was not second after that awful realization, that I heard the news of Marilyn's death and the damn holding back the tears just burst. I stood there with my mother and father in the room and started to cry. I broke down and I could not stop. I just stood there looking at the both of them and cried my eyes out. To try and gain some control, and hide from the embarrassment I felt, I ran out to the screened in patio that was attached to the back of our house. It was a sultry August day in New Jersey. The pouring rain only added to my sorrow. I just sat there and sobbed long uncontrollable sobs, as the tragedy of my family situation overwhelmed me. I knew then, there would never be a happy ending for our story. I could see the look on my mother's face before I ran out. She was completely surprised at my reaction and didn't know what to make of it. She followed me out to the patio. I remember her sitting next to me, completely bewildered by what she was seeing. Her intuition was telling her that there was something more to my tears, but she asked me anyway, "Are you sad because Marilyn Monroe died?" All I could say through my tears and snotty nose was, "Yeah Mom", because my young self did not have the words to describe the awful tragedy I saw. I guess I also will never forget where I was the day Marilyn Monroe died. Go places! Click on each of the underlined items.